Garmin, known best for its satellite GPS devices, has gotten into the wearable tech game with vívofit, a new lightweight fitness band that the company announced in January at Consumer Electronics Show (CES) 2014 and released this spring. "Garmin has been in the business of wearables for about 10 years now," says Amy Johnson, Garmin spokesperson, referring to their popular GPS watches for runners and cyclists. "This is our first venture into full-day activity tracking." Garmin launches vívofit into a very full field. IDC expects more than 19 million wearable devices to ship in 2014. That more than triples last year's sales. IDC also expects the global market to reach 112 million units in 2018. "It's getting crowded, and it's only going to get more crowded," Ramon T. Llamas, research manager, mobile phones at IDC, says of the wearable tech field. "[Garmin's] not the only one to do this. Vendors that have well-developed platforms on their own have a head start." 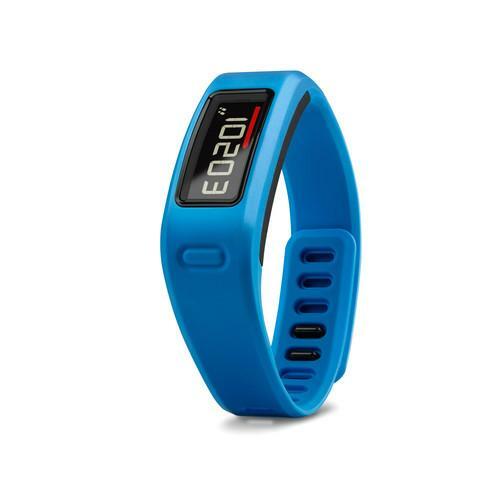 The vívofit, which retails for $129.99 for just the band and $169.99 with a heart rate monitor bundle, tracks activity level through steps taken, distance traveled and calories burned. It assigns user goals and adjust goals as they're met. It also tracks sleep quality. It alerts you about inactivity, too. When you have been idle for an hour or more, vívofit flashes a red "move" bar and only goes away after you have walked for a few minutes. Garmin is also banking on the vívofit being more like a watch to put it above the rest of the field. The battery lasts for one year, so it doesn't need to be recharged every few days. It also displays time if you want to wear it instead of a separate watch. Garmin's edge in the crowded wearables market comes in that it's already well-known to a key niche: Fitness users. In 2013, Garmin's fitness devices brought in $356 million in revenue for Garmin, which represents 14 percent of the company's total revenues for that time period. Vívofit taps into that base by syncing with Garmin Connect, which is Garmin's online fitness community where runners and bikers upload their workouts. So far, they've logged more than 4 million miles into the site. Johnson describes Garmin Connect as the "missing piece" for capturing daily activity data. "You already have your workouts in there. This is what you're doing the rest of the day," she says. "So when you're looking in Garmin Connect, you can really get a feel of how active you were in your entire day." Johnson also points out that users of the site already want stats about their athletic performances; this extends that information, she says. Two additional vívofit features help present a more accurate fitness picture. One, vívofit is water resistant up to 50 meters, so users can swim with it. Two, when users activate the heart rate monitor, the vívofit adjusts calories burned in accordance to how hard the heart worked during a workout. Llamas describes Garmin's approach to the wearables market as "much more detailed segmentation" than Fitbit and Jawbone and (until recently) Nike, who he says are "going after every single customer in the country. Instead, Llamas says, Garmin targets "typically someone that's very passionate about their exercise and working out and knowing exactly how they're doing on their workouts. If I take a look at these vendors who do this kind of stuff, Garmin's plucking the apple directly from the tree and not necessarily from the barrel." Rumblings about the strength of the wearables market has been sounding, especially since April. Late last month, Nike laid off part of its FuelBand fitness tracker team. Some say this marked a crack in the foundation of the wearable tech business. Others speculate that Nike's software may wind up on an Apple watch or band. Llamas says it's just the market shaking itself out. "The wearables market - particularly this segment of the market - [is] going to have growing pains considering there's a lot of copycat vendors and products and services" he says, adding that Nike faltered in that the FuelBand device could only sync with an iPhone. There's also another challenge on the horizon for Garmin and other wearables vendors: The app field. RunKeeper, a fitness tracking application with more than 25 million users, just released RunKeeper Breeze, which also measures overall activity. Right now, it's only available on the iPhone 5S, but RunKeeper tells Runner's World that it will be available for other devices in the future. Read more about peripherals in CIO's Peripherals Drilldown.